We were just finishing up a team meeting following my senior year at Mankato State in 1981, when coach informed me that I had been named as a Top 10 finalist for a new award being given the best player in men’s college hockey. 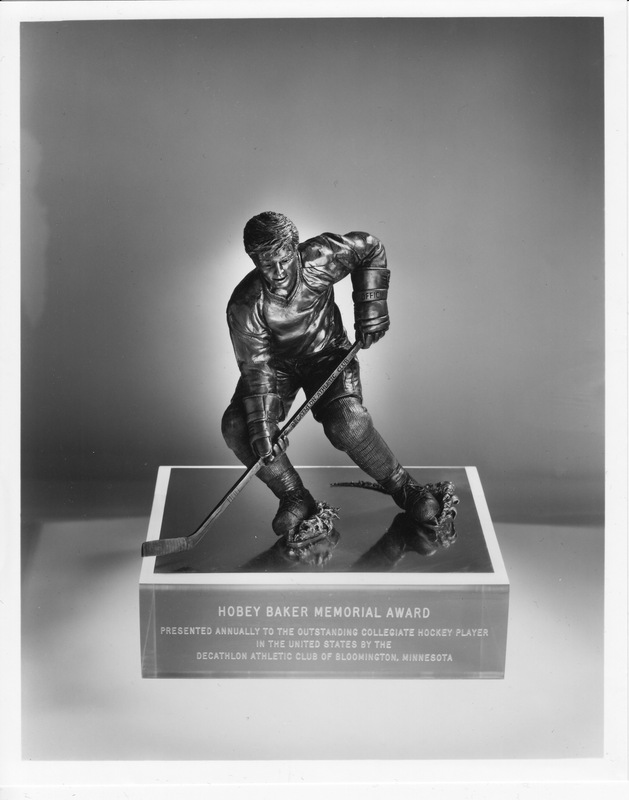 It was called the Hobey Baker Award, in honor of a standout athlete from Princeton University. While things went well for me in Mankato, I had a hard time believing the selection committee would consider me, a NCAA Division II goalie, as one of the 10 best players in all of men’s college hockey. It was an unexpected and humbling honor to even be considered for this prestigious award. When you look at the list of finalists at the bottom of this page, it was clear from the beginning who would be winning the award. And no one couldn’t argue with the choice. 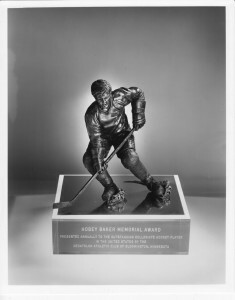 Neal Broten was named the winner of the first annual Hobey Baker Award. The Roseau, Minnesota native was a star at the University of Minnesota who already had an Olympic gold medal and a NCAA championship on his impressive hockey resume. I was invited to attend the award banquet, which was held at the old Decathalon Club in Bloomington. The guest speaker was Mr. Hockey, Gordie Howe. At the banquet, I got to meet Neal Broten. I had played against him when my Edina-East team defeated his team in the quarterfinals of the state high school hockey tournament. We talked about that game for a bit, but not for very long. It was huge thrill for me to meet Broten, who continued on to have a magnificent NHL career. Being named a Top 10 finalist for the first-ever Hobey Baker Award means more and more to me with each passing year. By the way, did you know that 1980 Olympian and Richfield, Minn., native Steve Christoff served as the model for the the Hobey Baker Trophy?